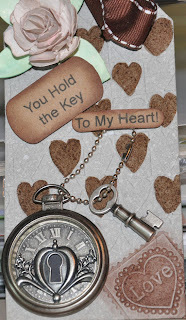 Well I have a new Tim Holtz obsession so i have joined a Yahoo group called all Things Tim and they are doing a compendium of curiosities thing going through book 2 and everyone has to make something with each page. I happened to have the pocket watch of Tims and decided even though it is past the due date I would like to do one. 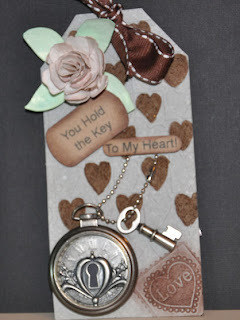 So I played in my scrap book room tonight and made a tag with it. I really liked the way it turned out. It is on Grunge board . Your watch turned out wonderfully! I saw that you were asking in the ATT group about where to publish these challenges. Linda's blog http://studiol3.blogspot.com/ is the place to go! Each Friday a new challenge is presented and you have until the following Thurs. to link up your version.